符合BS EN ISO 2813, DIN 67530, ASTM D253和JIS 8741。仪器和标准板的校准证书可追溯到BAM。±1%的精度，显示分辨率为0.1GU. The Stargloss Glossmeter is essential where an aesthetic appearance of the coating finish is required and to ensure uniformity of the surface finish. The gloss value is determined by directing a light, which has a similar wavelength to the human eye, at the test surface and measuring the amount of specular reflection. Gloss is measured with angles of 60° and 20°. The 60° angle is universal for all applications. The 20° angle gives improved differentiation of measurement on high-gloss coatings above 70 gloss units. Haze measurement is required where high-gloss surfaces have a low reflection contrast. The Haze measurement is the difference between readings taken with the 20° and 60° angles, complying with International Standard ASTM D4039. 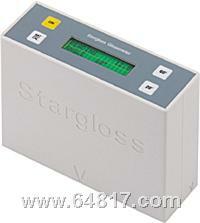 The Stargloss will automatically calculate the Haze reading.